AG Pittsburgh is proud to mentor students from local educational institutions. We have participated in an intern program with many students over the past few years. We are committed to help grow young people within their desired fields. Prospective interns are interviewed by management. We want to make sure they would be a good fit within our team. We search for individuals who are inspired and determined for success. All interns are immersed within our culture. We want them to be strong members of our team while they are here. In some cases, employment is offered to the strongest of candidates. Most interns come from design and/or marketing educations. In most cases, internships are for completion in their respective programs. Each intern spends time within each department. They learn the processes of production from beginning to end. We allow them to pursue training and education within the departments they choose. AG Pittsburgh will continue to develop this program. We accept resumes all year round. We are always looking for the best and brightest. Developing and growing within our community is a priority at AG. Interested in submitting your resume? Contact us at us514@agpittsburgh.com. As a graphic design student, I have the great opportunity to finish my three years at the Art Institute of Pittsburgh with an internship at AlphaGraphics in the Cultural District. These past few months have been so important to me because I am gaining invaluable real world experience in graphic design and production. The staff at AlphaGraphics has been so warm and welcoming, that I immediately felt right at home. Everyone has gone above and beyond to make sure I’m getting the most out of this experience. It’s wonderful to be part of a team that is so dedicated to their company and their customers. Interning here has made me realize that I would be extremely fortunate to begin my professional career working at AlphaGraphics. Throughout my time at my internship, I have spent time shadowing the graphic designers, production and put together the final products in the bindery. This experience has made me realize my love and passion for graphic design even more. I never expected to have an internship that brings me so much joy. I have loved every moment that I have spent with this company and I want to give a personal thanks to AlphaGrahpics for taking me in as an intern and giving me the knowledge I need to feel confident in starting my career. Color management, if followed correctly, ensures color dependability throughout a digital process. To get the best results, you need to understand some basic principles. In today’s digital workflow, we use a wide variety of image capturing devices and an equally large number of output devices to create prints. Due to a variety of factors, a digital file cannot perfectly correspond to a printed sheet. The most evident mismatch is because we use Red, Green, and Blue (RGB) to describe digital image colors, but we print with Cyan, Magenta, Yellow, and Black ink (CMYK). Color management helps to minimize these factors so that a consistent and fairly accurate color match is possible. The CMYK color model (process color, four color) is a subtractive color model, used in color printing, and is also used to describe the printing process itself. CMYK refers to the four inks used in some color printing:cyan, magenta, yellow, and key (black). Though it varies by print house, press operator, press manufacturer and press run, ink is typically applied in the order of the abbreviation. 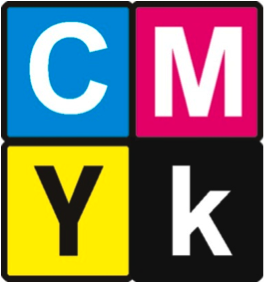 The “K” in CMYK stands for key since in four-color printing cyan, magenta, and yellow printing plates are carefully keyed or aligned with the key of the black key plate. Some sources suggest that the “K” in CMYK comes from the last letter in “black” and was chosen because B already means blue. However, this explanation, though plausible and useful as a mnemonic, is incorrect. The CMYK model works by partially or entirely masking colors on a lighter, usually white, background. The ink reduces the light that would otherwise be reflected. Such a model is called subtractive because inks “subtract” brightness from white. When a digital image is printed, its RGB numbers are converted to CMYK numbers for the printer. This conversion will produce unexpected color if not done in a controlled and predictable manner. 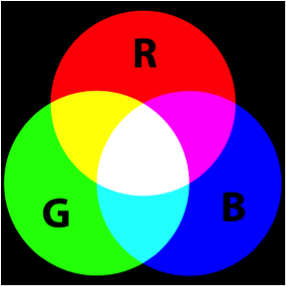 Overlay RGB and CMYK color spaces and you’ll see that colors in RGB that do not have an exact equivalent in CMYK. What this means is that there are often colors that we see on our monitors that cannot be reproduced perfectly on the printed sheet. Color management is a process by which we pick the best possible CMYK color to match a given RGB color. With all of these conversions from one color space to another, from one device to another, the color of an image would appear differently on each. What a color profile does is describe what the colors will look like on a particular device whether it is a computer monitor, an ink-jet printer, or a digital press. The color profile contains a Look-Up Table it uses when fed the data that describes a certain color on your monitor and converts it to the same color on a digital press. In color management, an ICC profile is a set of data that characterizes a color input or output device, or a color space, according to standards disseminated by the International Color Consortium (ICC). The standard ICC Profile is based on the GRACoL2009 reference used in high-end commercial printing. The entire print network adheres to this standard on all of their print devices for the most consistent results possible with print on demand. By using this color profile, you may soft proof your images while in RGB to see how they will look when printed, or use the profile to actually convert your images to the CMYK color space of the print device to eliminate the press-side conversion. This gives you more control over the images and how they will eventually print. 5 Helpful Hints for Your Order’s Printing Success! When you’re gearing up to send your files to us, always consider sending the native files as well. This can be helpful for situations involving changes to the text or images. Sending a PDF is always acceptable, but keep in mind that when we have the natives to work with, the job can be done quicker if there are numerous changes. As you know, Microsoft Office can be a bit tricky sometimes. Compatibility is always an issue and can cause the document sent to us to be changes without us knowing it. When sending us an office document, it’s always helpful to send us a PDF as a reference as well. Sometimes you don’t realize how a job will look until it’s printed. When in doubt, when creating your projects, always use the highest resolution possible for all images, logos, etc. Below is an example of an image going from a small number of pixels per inch to a large number of pixels per inch, causing the image to go from low to high quality. A bleed is a background color or image that extends beyond the trim area. This allows the bindery to trim the document down to size without a white line of the paper showing through. A bleed gives the final piece a nice looking clean edge, with image running right up to the trim edge. It is preferred to have at least 1/8” bleeds included in any documents submitted for printing. All of these hints are just ways to help us meet and exceed your requirements through timely delivery of quality products and services. We strive to continuously improve performance through analysis of quality processes and customer feedback. In August 2010, Google Pittsburgh enlisted AlphaGraphics in the Cultural District to design 2 sets of conference room signs for their new space at Bakery Square, which formerly operated as the Nabisco Bakery from 1918-1998. Playing on the history of the building, 28 Nabisco-themed signs were created for the 6th floor conference rooms, each named after a popular Nabisco product. These signs reflect design elements from Nabisco packaging using bright colors, fonts, and stylized shots of product packaging. The 24 signs for the 7th floor conference rooms feature a Pittsburgh: City of Bridges theme, with each room named after a specific local bridge. Each of these signs feature a photograph of the respective bridge, as well as a screen shot from Google Maps featuring the bridge's location. What makes this signage unique from most are the QR codes featured on each one. These allow Google employees to view each conference room's schedule when scanned with a smart phone. ThePittsburghChannel.com recently featured a video of Google Pittsburgh's grand opening on December 7, 2010. You can check it out here, and keep an eye out for the signage!